WERE REAL HAGGIS PLOGS EVER EATEN BY HUMANS? Recently an obscure legend has emerged and startling new unproven evidence has been found that people once may have bred the Haggis, not just for its lovely tasty stomach-wall and contents ….but for their plogs (droppings)! A local historian told us that he heard someone blathering on and on about this at his local pub. Apparently during the old man’s mumblings he was heard to say that many people used to eat Haggis plogs as a delicacy in the olden days. The following pictures and information are based on this man’s strange story. A story that was to inspire a local company to replicate Haggis plogs using high quality chocolate coated raisins. Scotland has lots of Haggis and apparently, many years ago, the main reason for breeding them was not for their tasty stomach linings and contents, but for the small brown spheroid droppings called plogs (plogules) that would fall from the backend of these amazing rare creatures. In olden days groups of people could be seen collecting thousands of plogs in the early evening, backbreaking work! Mechanical methods were introduced to speed up the picking process. 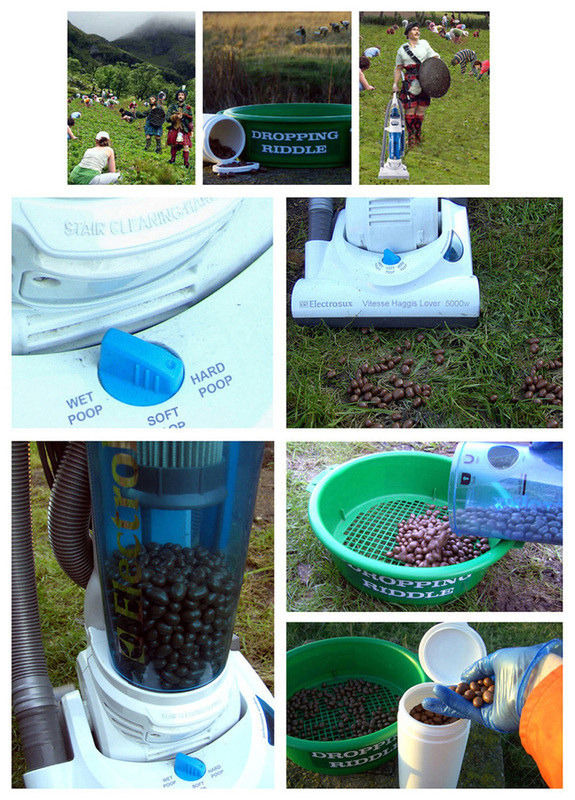 This is a similar method that was used in harvesting Sheep Droppings except the dial on the vacuum collector is set to ‘Hard Poop’ instead of ‘Soft Poop’. Haggis plogs were collected and air dried in the summer months. The plogs were then expertly washed by highly trained and diligent workers. They needed to be washed very quickly, before the plogs lost their natural lovely shape and distinct flavour. The process was known as ‘Plog Washing’ The plogs were then spread for air drying using a 'plog rake'. They were then put in sacks ready for shipping.